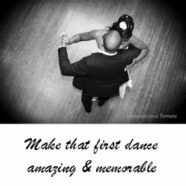 Growing in popularity are choreographed dances for the couple’s first dance or even the bridal party’s entry into the wedding. I have seen a number of these on youtube. Another favorite of mine is the couple dancing to Righteous Brothers’ “Unchained Melody”, better known as the song from Ghost. The record scratches and… it turns into Sir Mix-a-Lot’s “I like Big Butts.” The couple breaks out with some sweet moves and give their guests a real show! Most couples will opt out of the dinner and a show option and stick with the traditional first dance. This a very sweet moment and allows the couple to get on the floor as husband and wife. But what if one (or both) don’t know how to dance? Awkward performance with two left feet? I think not. So, how do you learn to dance for the big day? You could ask your parents to let you stand on their feet while they twirl you around the room or you could take classes. Dance classes can be expensive! Knowing where to look or how to get a deal can help trim down the wedding budget. Groupon and other websites, like Living Social, have local deals for many activities, which often include dance classes! You can sign up for a few of these sites and keep your eyes open for any dance specials. Local rec centers or the YMCA may offer dance classes or arrange special event nights with an instructional segment. Yelp and other review sites can direct you to dance studios that may offer individual or group classes. As a bay area resident, I have many options at my fingertips! After doing some research, I found numerous free and low fee classes in my area. Dolores Park in San Francisco provides a dance class in the park every Saturday at 1pm. Although these lessons might not prepare for a dance off, they will give me enough instruction where I can do a two step and a few extra fancy moves without embarrassing myself. For those with limited options or access, youtube has numerous instructional videos teaching beginners how to dance. Searching for “learn how to…” and a plethora of options will pop up. This includes choreographed dances! Whatever you decide to do, your first dance will be special and intimate. Enjoy it!